The way people work has changed dramatically, and it is likely to continue to change as tech, markets, worker demographics, etc. change. And as people change the way they work, so do the spaces in which they work. Although not a new concept, the shared office space model is an increasingly popular choice for entrepreneurs, startups, and small and large businesses alike. Not to be confused with coworking, which also is based on a shared work environment model, shared office spaces provide their members with private furnished offices, access to professional, fully-equipped meeting spaces, a variety of business services, and the support of a dedicated team. It basically allows you to outsource the running of your office to a team comprised of experts at doing just that – running a professional and efficient office. And not only do you get to outsource these critical functions, but it’s often the most cost effective solution with the most flexibility built in. Beyond these immediate benefits, there are a multitude of additional benefits that are oftentimes overlooked, some of which are outlined below. When you lease traditional office space from a commercial landlord, you are renting from someone in the business of renting space and it’s up to you to make it comfortable and productive. When you rent a private office from a shared office provider, you are renting from someone in the business of supporting businesses, which means you are paying for a service that also includes a place to work. This means they understand what business services are valuable and further they know how to provide those services effectively. For example, some providers offer customized live-call answering, which means you have someone answering your calls in a professional way that will represent your business well to your clients and prospective clients. And that’s just one of the many potential business services a company can benefit in these spaces. Along the same vein as business services, shared office space providers are experts in the technologies that businesses need to operate. From high-speed Internet and secure wireless connectivity to conferencing equipment and copiers, companies increasingly rely on tech, which mean it’s no small headache you can avoid when you have a dedicated team managing your tech. And not only will you have a team troubleshooting issues and managing tech vendors, but you’ll also have access to enterprise-class technology that was designed specifically to support business operations. Think of all the time you could save if it were someone else’s responsibility to research, purchase, maintain, and troubleshoot all the tech you need to run your business, and that’s not to mention the frustration you will avoid. From building and Internet security to the protection of physical assets, security is an important concern for businesses on many levels, and shared office space providers often include provisions to address these security risks. It all starts with general building and floor security. Shared office providers often operate out of a larger building that includes its own security protocols such as the logging of all visitors with a valid ID. But even if a provider does not operate out of such a building, the provider’s onsite team will have personnel at reception greeting and checking in all guests. Then there’s the fact that you will have a private office with a door that can be locked whenever you step away or leave for the night. While protecting your physical assets is important, protecting your intellectual property and digital assets is paramount when considering security in your office. The loss of such data via poor Internet security could be fatal to your company or at the very least very damaging on multiple levels. Shared office space providers understand this potential threat to your business and their tech will include precautions built in, like keeping your data on a private VLAN vs being on a public network. Working in a clean and well-designed environment has a multitude of benefits from general health and productivity improvements to sending the right message to your clients and colleagues. So what’s better than working out of a clean and nicely decorated space? Not having to do anything yourself. By moving into a shared office space, you are moving into a place that has already been carefully decorated and designed. Of course, you will have the ability to customize the look of your own, private space, but the common spaces will be already expertly designed. To learn more about the process that went into designing Work Better’s locations, you can download a free copy of our guide to shared workspace design, Design Better. In regards to cleaning and janitorial services, shared office space providers will either have an in-house team or will partner with a cleaning vendor, which means you get to work out of a clean space without having to manage yet another vendor yourself. You’ll be able to invite clients to visit you at your offices with confidence, knowing that reception and other common areas like the kitchens and meeting rooms will be spotless. Further, should you need to move and/or dispose of large items, your onsite shared office team will be able to help you coordinate the process. Moving into a shared office space means moving into an already established, larger community that you now get to be a part of. Beyond the potential social connections you may make on your run to grab some fresh coffee, shared office providers will often host regular member happy hours and events that can be great for networking. With so many different companies in different industries operating in one space, it’s likely there will at least be a few that could be potential partners and/or will have knowledge and expertise they can share. And while other workplace options, like coworking, provide a similar built-in community with their membership, it is only in a shared office environment that you get community and get to maintain high levels of privacy. 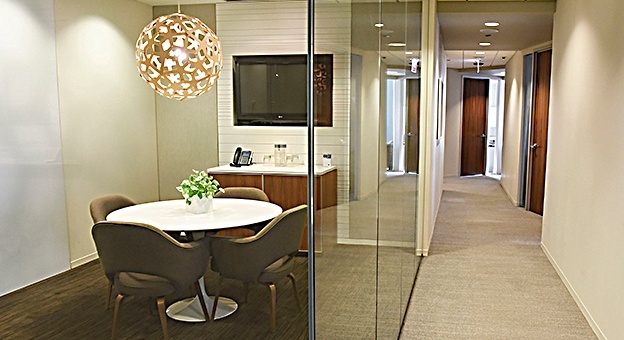 Interested in learning more about the benefits of working in a shared office environment? Contacts us to learn more.